The Samsung Galaxy S6 vs S7, what has changed? Samsung has just announced two new flagships, the Galaxy S7 and Galaxy S7 Edge. But here, we’ll talk about S7 and what has been improved from last year’s Samsung Galaxy S6. Samsung has always been the leading Smartphone manufacturer and they showed it last year when Samsung released S6 and S6 Edge. It’s time for Samsung to Shine again with its Galaxy S7. The new Galaxy has improved a lot. Now let’s talk about the real deal. What Samsung Galaxy S6 was lacking in? Although Galaxy S6 was one of the Best Smartphones last year but it could have been Better. Samsung removed the SD Card slot to promote it’s cloud Storage which people didn’t like and poor battery life on Galaxy S6 as compared to other flagships smartphones. Also the smartphone was not water and dust resistant. 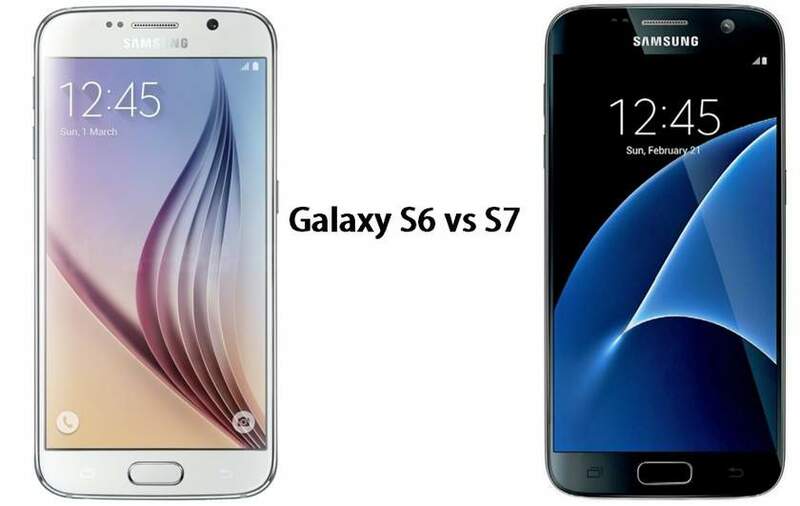 The Galaxy S6 vs S7, some may say that this comparison is not logical, as there are major upgrades in terms of hardware but in a customer’s perspective, only one thing counts at the end- user experience. The Samsung Galaxy S6 was powered by an Exynos octa-core chipset coupled with 3GB of RAM and internal memory options of 32GB, 64GB and 128GB. MicroSD card support was taken away, don’t know why but this time Samsung has learnt a lesson and provided it back on S7. The S6 used to have a 2550mAh battery which was poor, this time they fitted a larger 300mAh battery and claimed that it’s much better, let’s see how it performs in real life. The Galaxy S7 will come in a couple of different hardware variants depending on the region. One will offer a quad-core chipset, while the other will have an octa-core chip. Samsung hasn’t disclosed the details, but there are some hints that the quad-core variant will be Exynos and the octa-core will be Qualcomm’s Snapdragon 820. Galaxy S7 has two variants based upon memory- 32GB and 64GB. What’s New on Samsung Galaxy S7? The New Samsung Galaxy S7 has improved a lot as we said before. The phone look stunning and beautiful as always with the same body language. Samsung Galaxy S7 tightened the flaws of Samsung Galaxy S6 with the return of SD Card slot which was not available on last year’s Galaxy S6. Their changes that Samsung made on Galaxy S7 are the design, it has now a little less Camera hump on the back and it is now much easier to pick up from the Table. The Smartphone is now also water and dust resistant just like Samsung Galaxy S5. Just like Galaxy S6, S7 does not have a removable battery and with a larger battery capacity of 3000 mAh than 2550 mAh on S6. The Battery is large so hopefully we will see a significant improvement on Galaxy S7. The Display is still amazing as S6 with Super AMOLED Quad HD display. Samsung Galaxy S7 has 5.1″ display. There is also a change in the Camera section. Samsung Galaxy S7 has a 12.1-megapixel rear camera with f/1.7 Aperture which Samsung claimed that the lens will receive 56% more light than before for better low light image, and hence they proved it once again- Megapixel count doesn’t really matter. There are also other little changes which we will let you know very soon. Also, you can take a look at the Galaxy S6 vs S7 comparison sheet we have added below, or jump back to the conclusion. Samsung Galaxy S7 has not a reinvented smartphone device but it really fill the holes that S6 made. The upgrade of the Samsung S Series is a great deal for the customer. There are other flagships coming from other Manufacturer so it is always interesting to look for them too and see which one is worth your money. Of course, if you’re using Galaxy S6 as your primary device, but want to upgrade due to various issues you face, you may consider Galaxy S7 to be a good option and also you may take a look at what LG G5 is offering. Also, we will be comparing the Galaxy S6 Edge vs S7 Edge, as S7 Edge seems to be much-improved from the S6 Edge not just in terms of hardware, but there are some significant changes in terms of OS and UI as well, stay tuned for more updates. Meanwhile, join us on Facebook to get all the latest updates on your newsfeed.